The Versailles gymnastics team placed second overall at the Troy Quad meet on Saturday, Feb. 9. Pictured left to right are Madison Ahrens, Ellie Barga, Greenville’s Emily Marchal, Jadyn Barga and Jayla Pothast. Versailles senior Morgan Heitkamp is seen here competing in a tournament earlier this season. Last Saturday, Heitkamp rolled a 595 series to finish first as an individual in the Unofficial MAC Tournament. 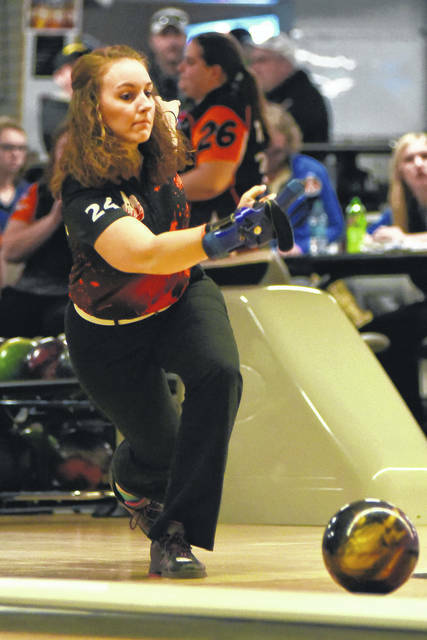 Versailles Lady Bowlers traveled to Minster to compete in the Unofficial MAC Conference Tournament last Saturday. The format was three regular games and two baker games of qualifying with all MAC teams then seeded based on their total pin fall. The first game consisted of Morgan Heithamp 195, Kalysta Thobe 178, Lindsay Cheadle 174, Morgan Barlage 172 and Haddi Treon 162. The Tigers rolled an 881. The second game consisted of Heithamp 190, Barlage 188, Thobe 178, Treon 160 and Cheadle/Jena Mangen 124. The Tigers game 2 score was 830. The third game saw Heithamp 211, Barlage 178, Thobe 170, Natalie York 164 and Treon/Madelynn Stewart 132. The Tigers third game score was 855. “Natalie York stepped up big in this match. She has not seen a lot of action in the regular games and I’m proud of how she responded,” said Coach Tyler Phlipot. The first baker game was comprised of Mangen, Stewart, Thobe, Barlage and Heitkamp. The Tigers rolled 166 for baker one. The second baker game was made up Mangen, Stewart, Cheadle, Barlage and Heitkamp. The Tigers only had one open frame in the second baker game for 215. The Tigers were seeded second going into best 2 of 3 match play with a total of 2566. The Tigers faced Parkway in the best of three baker games to see who would make it to the semifinal round. The first baker game consisted of Mangen, Stewart, Cheadle, Barlage and Heitkamp. The Tigers rolled a 169 to Parkway’s 85. The second baker game was bowled by Treon, Stewart, Thobe, Barlage and Heitkamp. Heitkamp struck out in the 10th and the Tigers finished 186 to Parkway’s 102. The Tigers then advanced to the semifinals. Versailles faced Minster in the final four. Once again, the Tigers needed to win two baker games to get to the finals. The first baker game lineup was Treon, Stewart, Thobe, Barlage and Heitkamp. The Tigers stayed consistent and rolled 179 to Minster’s 161. The second baker game was comprised of Treon, Stewart, Thobe, Barlage and Heitkamp. The Tigers were able to pick their spares up at the end of the baker game to roll 156 to Minster’s 134 to advance to the finals. In the finals, the Tigers took on Coldwater for a chance to win the unofficial MAC tournament. The first game in the finals consisted of Stewart, Cheadle, Treon, Barlage and Heitkamp. The first game got off to a very slow start for both teams with Coldwater pulling out the win in match one 117-107. “We had our chance in game one, but for some reason we just could not pick up a spare. We only had two marks in this game,” said Coach Phlipot. The Tigers needed to win match 2 to force a third game to have a chance for the championship. The lineup consisted of Thobe, Cheadle, Treon, Barlage and Heitkamp. The Tigers were unable to out strike Coldwater with Coldwater winning the match 187-160. “I am proud of the whole team and how they bowled. It was a mentally challenging day, also physically exhausting. Madelynn Stewart came into the bakers and did a really nice job today,” said Coach Phlipot. Morgan Heitkamp was the top individual bowler for the day taking first place overall with a 595 series. Other notable individual bowlers included Morgan Barlage in third place with a 538 and Kalysta Thobe with a 516. “It was nice to see Morgan Heitkamp bowl well. She has been struggling with her timing and release. Morgan Barlage was steady all day and Kalsyta Thobe was very consistent,” said Coach Phlipot. The Lady Tiger Bowlers will hit the lanes again at 9 a.m. on Wednesday, Feb. 13 in the Division II sectional tournament at Marion Lanes in Huber Heights. 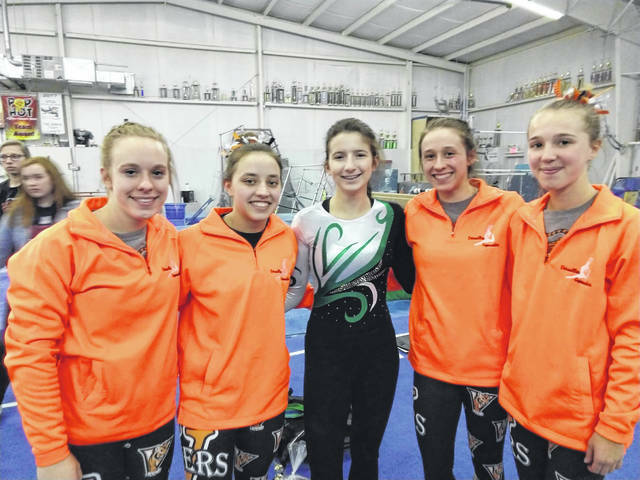 The Versailles and Greenville gymnasts competed at the Troy Quad meet on Feb. 8 with the Lady Tigers capturing second place overall among the participating teams that included Greenville, Versailles, Troy, Northmont, Beavercreek and Arcanum. Versailles recorded its highest point total of the season with a 139.85, which is 3.95 points better than last week’s meet and 6.85 points better overall for the season. Troy was the team champion by .70 points over Versailles. Individually for Versailles, senior Madison Ahrens placed second in the All-Around. She placed first on Floor and Balance Beam and also placed third on Bars and fourth on Vault. Ahrens had a nice improvement over last meet of 1.95 points. Senior Jadyn Barga also had a good meet placing third in All-Around. She was first on Vault, second on Bars, she tied for second on Floor and tied for fifth on Balance Beam. Junior Ellie Barga placed fourth on Bars, Beam and Floor and fifth on Vault. She also had a nice improvement over last meet by 1.10 points. Sophomore Jayla Pothast also had a good night tying for seventh in the All-Around. She placed eighth on Bars and 10th on Beam. She also had a nice improvement over last meet of 1.15 points. For Greenville, sophomore Emily Marchal had a great night as well. Her biggest improvements were on Vault with a .60 improvement and Bars with a .30 improvement. The Greenville and Versailles gymnasts will compete again in the Dayton City Championships at Miamisburg High School. The meet will begin at 11:15 a.m. This Saturday, Feb. 16. The Trojans connected on seven 3-pointers in routing host Bradford last week by 49 points. Evan Atchley had three triples and led the team with 15 points. Carter Gray was next with 12 points including one trey. Wade Meeks had two of the triples and 8 points and the other 3-ball was by Isaiah Hootman for his total points in the game. Kegan Fair led the Railroaders with 5 points. Evan Hiestand had a team-high 22 points in leading the Tigers to a Midwest Athletic Conference win over Coldwater last Friday. Hiestand accounted for all his points on 10 regular baskets and a pair of free throws. Michael Stammen also reached double figures with 12 points for Versailles. Coldwater’s Bruns had a game-high 26 points, but no other Cavalier had more than 4 points. Noah Walker and Tyler Beyke each had 18 points for the Green Wave, but Randy Collins Jr. scored a game-high 31 points in leading the Arrows to a win on Saturday night. Beyke and Walker each had one 3-pointer while Walker mad 11-of-16 free throws and Beyke was 7-of-8 at the line. Easton Lewis also contributed 18 points for Tecumseh. The Lady Wave won their final regular season game at Sidney on Saturday. Greenville was led by senior Koryann Elliott with 14 points followed by junior Haleigh Mayo-Behnken with 11 points. Mayo-Behnken also had 9 rebounds, 3 assists and 8 steals in the game. Sidney was led by Emma Wiford and Samantha Reynolds each with 6 points. Greenville finished the regular season with a 10-11 overall record and 6-9 in the Greater Western Ohio Conference American North Division. They will open tournament play at 3:30 p.m. against Bellefontaine on Saturday at Springfield High School.